How can you simulate a retina display (HiDPI mode) in Mac OS X 10.8 Mountain Lion on a non-retina display? Search for, download, and install Apple's free Additional Tools for Xcode 8 (for previous Xcode releases search for Graphics Tools for Xcode according to your version). Note: free Apple Developer account required. Go to menu: Window ---> UI Resolution. Check Enable HiDPI display modes. If using multiple display, select the configuration window on the display you wish to simulate HiDPI mode on. Under Resolution:, select Scaled radio button. Find a desired resolution postfixed with (HiDPI) and select it. Your display is now running in HiDPI mode, simulating a retina display. I found the following instructions. It seems to work, and it is much easier than the Quartz Debug approach. "Enable HiDPI mode in Mountain Lion w/o Quartz Debug"
For users trying to do this on El Capitan, please read the FAQ on SwitchRes's website. Also, if something's still not working after you did all the steps in the FAQ, consider uninstalling and reinstalling SwitchResX. That solved the issue I was having on one of my laptops. After reading through several forums, websites, blogs. I am here to present a solution for users with 15" MacBook Pro with Retina display connected to a Thunderbolt Display. These methods DO NOT work for MBPr with Thunderbolt Display, for whatever reasons. You will not see the HiDPI options to be selected. The only tool I found that actually gives us the options is SwitchResX. However another problem exists here. Most users with this setup, I believe, are trying to use 1280x720 HiDPI because it's half the native resolution of the TBD. 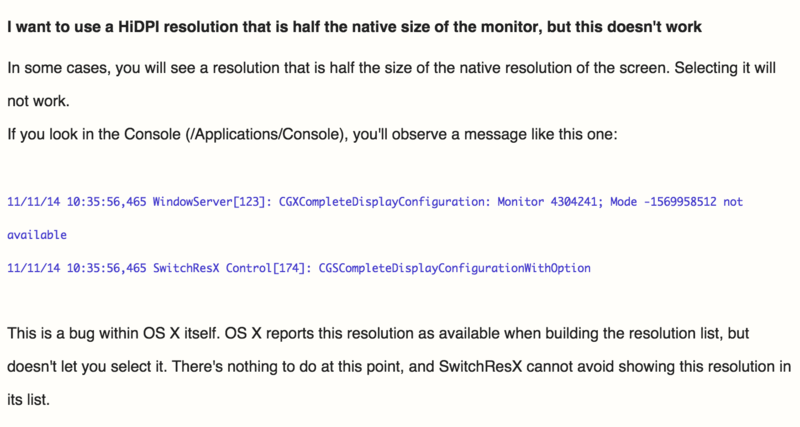 According SwitchResX's FAQ, in some cases it is not possible to set to this resolution because of a bug within OS X itself. After contacting the developer, he presented a workaround - adding one more pixel - which worked for me. 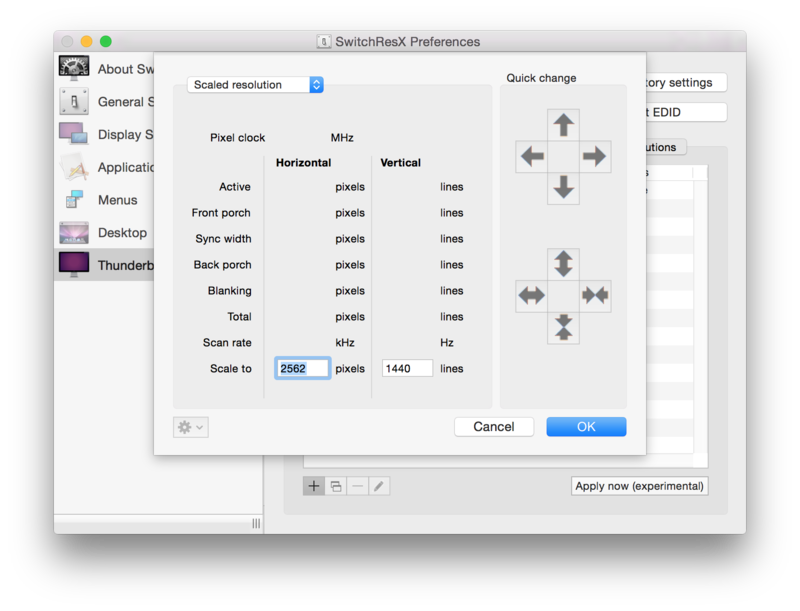 Install SwitchResX and open it from System Preferences. I hope this answer gets to users with this setup because it is really frustrating to use 16:10 resolution on a 16:9 display. For those unable to enable HIDPI on rMBP or new MBA, I experienced the same on my rMBP 15" with Air Display. I solved the problem by installing SwitchResX. With the boolean setting enabled as shown in the referenced gist, the HIDPI setting shows up. Dragging seems a little laggy in Air Display, but otherwise works great. If your monitor supports it, it may also be worth setting the DisplayPort version to 1.1 instead of 1.2. I have a late 2010 Mac Air with a Samsung S27D850 display and had all sorts of intermittent resolution switching issues until I made that change. As for me its pretty good app that give you opportunity for changing resolution any that you want. SwitchResX for Mac and MacBook. This app resolved all my problems with resolution. Not the answer you're looking for? Browse other questions tagged macos osx-mountain-lion retina-display or ask your own question. How to test a website for Retina on Windows without an actual Retina display? How can I Remove .DS_Store files from a Git repository? Where is Oracle's (Sun's) JDK/JRE installed on Mac OS X 10.8 Mountain Lion? Do Swift-based applications work on OS X 10.9/iOS 7 and lower?